Tell my godson he’s having meatloaf for dinner and his face will fall. His shoulders will slump and his eyes will have that “dead man walking” stare. I understand. We’ve all suffered from CNMD (Chronic Nasty Meatloaf Disorder) at one time or another. But tell MY boy he’s having turkey meatloaf for dinner and all of a sudden the day’s getting much better. He always asks with anticipation “with butternut squash and asparagus? Awesome!”. I love using turkey because it’s much lighter and no matter how hard you mix it, it will not toughen up. What is important is to season the mixture well because you know how bland ground turkey can be. I usually always use quick, not instant, oats instead of bread crumbs. Might as well make it healthful when you can. The oats just disappear into the mixture just like the bread crumbs. Last night, however, I found myself out of oats. Damn. And after a full day of work, I am NOT going back out into the dark for anything. Anyway, I knew there had to be something I could use and after rooting around…voila! Le Wheat Germ. Works great, loses itself in the mixture and, also, packs a healthy, nutritional punch. 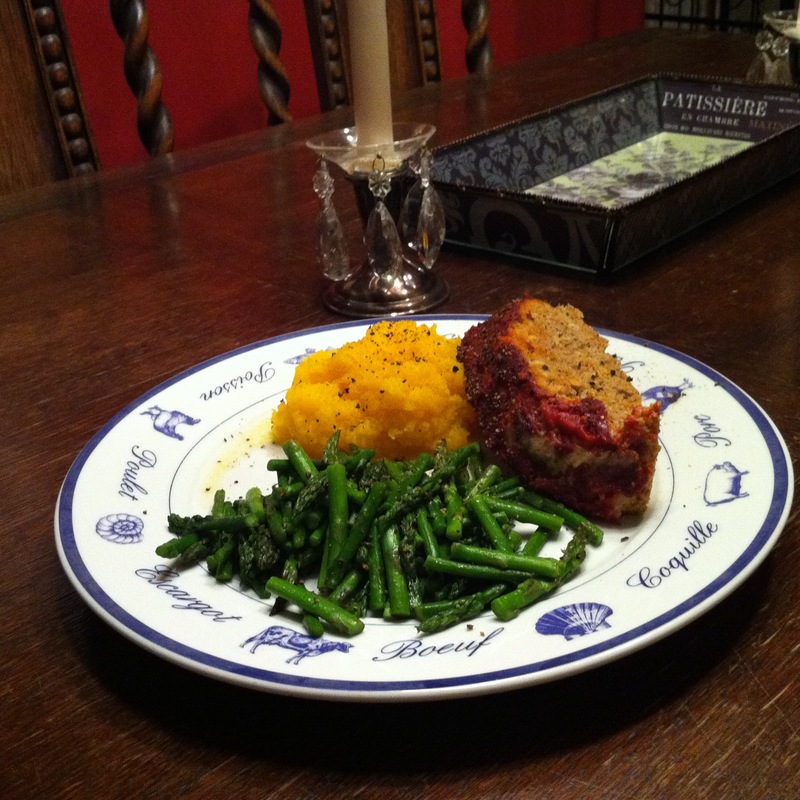 Last night’s meatloaf was covered tomato paste but I often make it with a peppercorn crust. Both produce a phenomenal sandwich the next day. And the recipe doubles well. 1 6 oz. can tomato paste or a thin layer of black pepper. I grind it directly over loaf. Mix all ingredients EXCEPT turkey, tomato paste and spray in a large or medium bowl. Incorporate well. Spray loaf pan or baking dish with non-stick spray. Mix turkey well into vegetable oat mixture and put into baking dish. Using a spatula or the back of a cooking spoon, shape mixture into a loaf. Spread tomato paste all over or grind pepper over turkey to make an even layer. Bake at 375° for 30-45 minutes. Now that’s a meatloaf a godson could love!